England kept their World Cup hopes alive with a 1-0 victory over Ireland at Lee Valley Park in London. Ireland had already reached the quarter-finals as group winners with victories in their first two games. India’s 1-1 draw with USA earlier on Sunday left England needing a draw to qualify for the crossover phase. A final-quarter goal from Giselle Ansley secured victory, sealed second place in Pool B and set up a match against South Korea on Tuesday. It was England’s only conversion from 15 penalty corners. The winners will face world number one ranked the Netherlands – who have scored 26 goals in their three matches – in the quarter-finals. Ireland await the winners of the crossover match between India and Italy. After two below-par performances in draws against India and USA, England dominated Ireland, who could not register a shot in the opening half. Ireland goalkeeper Ayeisha McFerran saved well from Sarah Haycroft and Susannah Townsend, but England’s pressure paid off seven minutes from time when Ansley’s shot deflected in off the stick of Hannah Matthews. 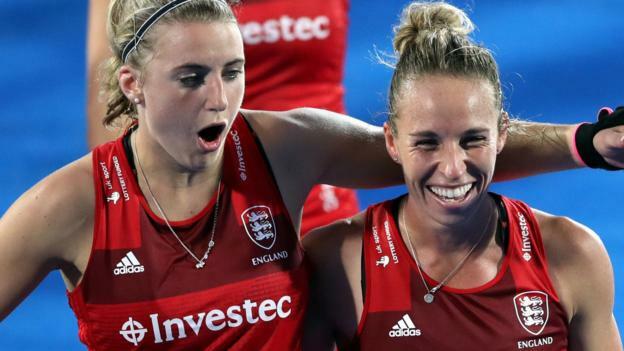 Goalkeeper Maddie Hinch said reaching the play-off “means everything” to the team. “This whole tournament has thrown up a huge amount of surprises – it could have gone either way today,” she said. England were good value for their win. They only won this game 1-0 but they had a lot of corners and seemed to dominate possession. They were much better than the first two games and showed great patience, but the worrying thing is that they are not scoring goals. It doesn’t matter how well you play – that is a problem. I don’t think many people would have expected Ireland to top the pool. They played really well for those first two victories but they were pushed back tonight. They’re going to have to try and rediscover the energy they had in their first two games, but they’re in a World Cup quarter-final so when they play either Italy or India they will give it everything.